Our condominium is in Building 5 Unit 203 and is located beachfront at the Siesta Dunes Resort on Crescent Beach, about a half mile north of Stickney Point Road on Midnight Pass Road. We are on the second floor with a beautiful view, taking in the pool area, landscaped grounds, and the beach. Siesta Dunes is the nicest resort on Siesta Key. Some of the unique features are the sun deck right next to the beach with a grilling area, plenty of lounge chairs, and a shaded area. The pool is spacious, surrounded by beach chairs, and a natural sea grass landscape theme. There is an elevator and laundry facilities ten steps down the hall from our door. Rental arrangements are initally made by me, and at reduced rates, and completed through the Siesta Dunes rental office. There is never any confusion about check-in time, keys, gate passes, or parking accommodations. We purchased our condominium at Siesta Dunes on Siesta Key in 1998 with another couple who have been our friends for 35 years. Prior to owning at Siesta Dunes we had a condominium with the same partners at Holiday Valley a ski resort near Buffalo NY. The decision to purchase on Siesta Key, at Siesta Dunes was simple. The beach being the number 1 consideration, and the overall lay out and amenities of the Siesta Dunes Resort. We loved the open green space and the low density. Siesta Dunes has the same basic amenities as most of the upper end resorts on Siesta Beach. Two things made a difference to us. The sun deck is a unique feature with lots of lounge chairs, umbrellas, and tables to have lunch or dinner. Second there are two grilling areas with high quality gas grills, I've never had to wait to use the grills and it's especially nice to make your lunch on the grill and have it on the deck. Those two features made a difference to us. 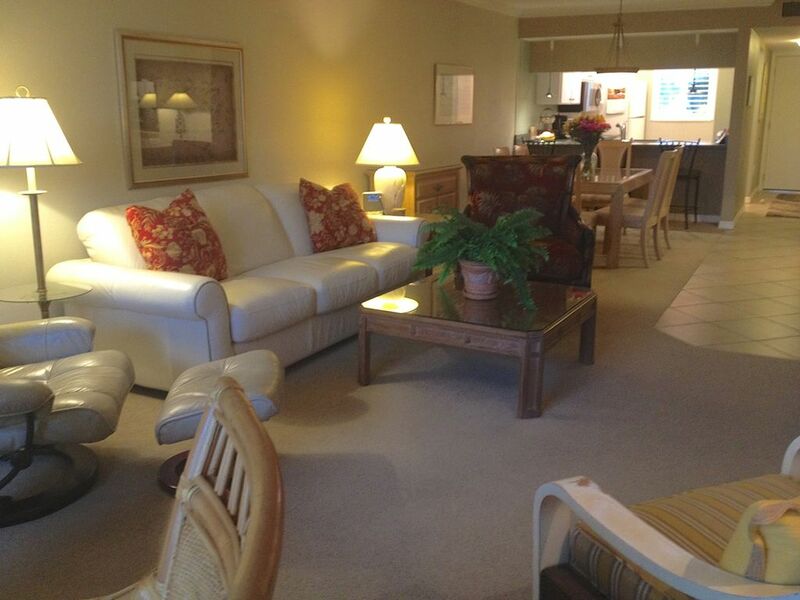 Siesta Dunes also offered an excellent property management staff to help defray costs. Main Bathroom has a stall shower, dressing area and it's attached to the master bedroom. The guest bath has a full tiled shower with glass shower doors right next to the entrance to the guest bedroom. Both have been updated. WE ARE BEACHSIDE, YOU CAN SEE THE BEACH, THE POOL, AND THE BEAUTIFUL LANDSCAPE. THERE ARE NO STREETS TO CROSS. Our kitchen is fully equipped, don't worry about having everything you would need to prepare a meal. FOR RENT AT CB'S WALKING DISTANCE. NICEST DECK ON THE BEACH. THERE'S ALWAYS PLENTY OF STUFF IN THE CLOSET WHEN YOU FIRST ENTER THE UNIT. Heated salt water pool, really nice. NEW Cable TV'S in Living Room and Bedrooms. LIVING ROOM TV HAS INTERNET SO YOU CAN USE YOUR NETFLIX, SONY, OR ANY OTHER INTERNET BASED MOVIE RENTAL SYSTEM. Kathy's suggestion for Siesta Dunes. Usually Tony provides the info but I will be happy to help you. There are 2 ways to access Siesta Key - the north bridge on Siesta Drive is convenient when coming and going to the city of Sarasota and north. The south bridge on Stickney Point Rd is convenient when coming and going off the south end of the island to shopping and Interstate 75. Our condo is very close to Stickney point Rd. The area south of the Stickney Point Rd is all residential and private but lovely to drive down and see and the bike path takes you all the way to the end. At the south end is a public beach called Turtles Beach and is less crowded than the Siesta Public Beach but not as wide and popular and the sand is not the same. But check it out anyway - there are a couple of restaurants down there - Turtles (casual) and Ophelia (more fine dining). And closer to the Dunes is Captain Curts (not much to look at but has good chowder), City Pizza and Miguels (fine dining). You can shop for groceries at the Crescent Market and walk there. Or you can drive to Publix which is off island but not far (near ‪41 and Stickney Point Rd.‬) There is also a market in Siesta Village with parking. In Siesta Key Village are many places to eat - we like The Cottage, Eat Here, the Sun Garden, Flavios. If you like music and food and drinking , there is the Siesta Key Oyster Bar (SKOB) and Daiquiri Deck. To get to these places you can drive but parking is sometimes an issue. It is walkable but will take awhile. You can get a ride on Johnnys Free Ride but calling them up and they will pick you up at the Dunes and drive you anywhere on the key. It is free but you have to tip them. It is a great option when you don't want to drink and drive or look for parking. For things to do it depends what your interests are. Enjoy the beach everyday - walk to the Point of Rocks wall (make sure to touch it, it doesn't count unless you do!). Watch the sunsets on the deck with a cocktail every night and stay for the afterglow as it is usually beautiful. You can rent kayaks etc or go fishing - just ask at CBs on Stickney Point (with in walking distance from the Dunes) If you like shopping there are a few shops in the Village to check out or one afternoon or evening go to St Armands Circle - there are many shops and lots of places to eat. We love Shores, Venizia, Crab and Fin and Tommy Bahamas there. You have to drive thru Sarasota and over the Ringling Bridge to get there. On the waterfront in the city is Marina Jacks with a restaurant and lots of boats to look at. Also a boat dinner cruise which is popular but we have never done it. The City Park there is nice to walk around after eating or stop at O'Learys for some shrimp. If you want to cook in the condo there are 2 Farmers markets to go to - Sat till ‪1pm‬ at main and lemon. It is awesome. And ‪on Wed 9-1‬ at Phillipi Creek is a smaller one. We buy our seafood at these markets from Maggies Seafood- she is the best. Downtown Sarasota is fun too - there are lots of shops and restaurants there. We like Louies Modern, Mediterraneo, Selva Grill, C est La Vie(breakfast). On the first ‪Friday night‬ there is a art gallery walk which is fun to do - lots of people walking around and sipping wine and looking at the art. If you have a rainy day or you love museums, go the Ringling Art museum and/or Ca d Zan tours. There is Selby Orchid Gardens near the waterfront if you like flowers. Past St Armands but not quite to Longboat Key is Mote Marine - interesting if you have kids. There is so much to do and I hope I have helped - please feel free to ask again. When you check in go into the Rec room and check out all the brochures and travel guides. And talk to people on the deck and at the pool - most people love to tell you about places to enjoy. I envy you - can't wait to get back there myself.